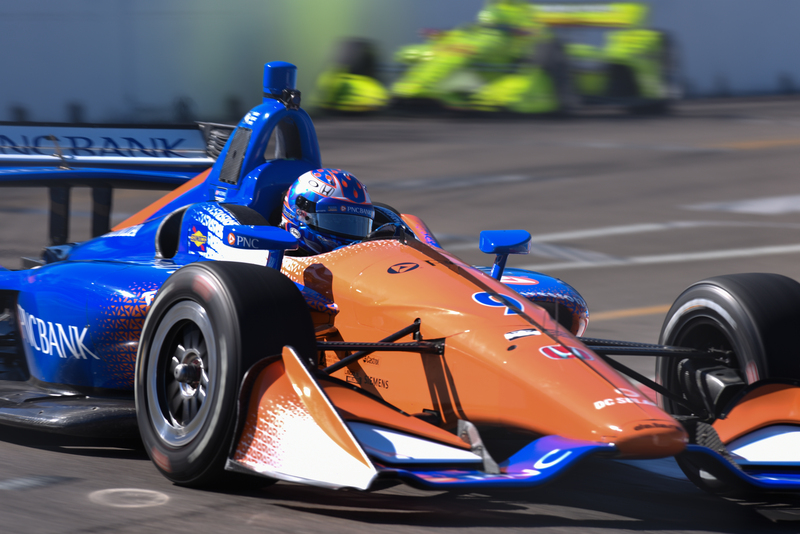 In this afternoon’s final practice session before qualifying, Scott Dixon led the way with a lap time of 1:00.7571 around the 1.8-mile street course. The four-time IndyCar champion will be seeking his first win at the track in his 14th start. In his No. 9 PNC Bank Dallara-Honda Dixon topped 2017 Verizon IndyCar Series Champion Josef Newgarden by .108 seconds. Rounding out the top five are Newgarden’s Penske teammate Will Power, followed by rookies Jordan King and Matheus Leist. The session would not come without its share of misfortunes for the two rookies. A.J. Foyt Racing’s Leist went off track around midway through the session in turn 4. The Brazilian, who lead the first practice of the weekend on Friday, got an assist from the AMR IndyCar Safety Team and continued in his No. 4 ABC Supply Dallara-Chevrolet. on after the red flag. With less than two minutes to go, Ed Carpenter Racing’s King made contact in his No. 20 Fuzzy’s Vodka Dallara-Chevrolet with the Turn 13 tire barrier, bringing out the red flag to end the session. All drivers were on track for 14 to 24 laps during the day. Andretti Autosport’s Marco Andretti and Ryan Hunter-Reay ran 14 laps each, while Juncos Racing’s Rene Binder ran 24 laps during the session. Next up on today’s schedule at the track are the first races for Pro Mazda and Indy Lights. Qualifying for Sunday’s race will take place over three sessions, beginning at 2:20 p..m. local time this afternoon. Follow Open-Wheels on social mediafor continued updates throughout the day for the Firestone Grand Prix of St. Petersburg.